Creativity is the quintessence of making life wonderful. Imaginative minds have introduced many creative ideas simply by using recycled plastic pallets. Pallets can be transformed into many objects used in our everyday lives. While some DIY pallet projects involve wooden pallets, many are turning to using plastic pallets. These plastic pallets can be transformed into many things, including furniture, home decor, picture frames, and so much more. With as little as a hammer, nails, and a dab of innovation, many things can be created from these recycled pallets. There are so many ideas for plastic pallets that can be modified to the interests and preferences of the individual. Pallet swings can be made from recycled plastic pallets to decorate a front porch or patio. These swings can accommodate a child or even an adult wishing to read a book in the fresh evening air. Inexpensive and comfortable kitchen tables and chairs can be created from these pallets. In the simple act of recycling these plastic pallets, many beautiful objects can be made. Many people are using these recycled pallets to make garden planters. Another DIY project with plastic pallets that is growing wildly popular is creating flooring or living walls. As these plastic pallets are easy to paint, many individuals are transforming their walls by creating what we call a living wall or a vertical garden. These vertical gardens are popping up in both homes and businesses. For people who live in apartments or small spaces, these living walls allow them the opportunity to have plant life without compromising their area. It is also said that these living walls are stress relievers. 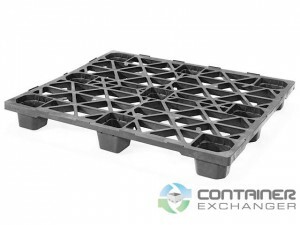 People are also discovering that these plastic pallets are the perfect solution to standing on a hard cement floor. In covering the floor with these pallets, the person can allow for both air and drainage. These floors are also easy to maintain and look great in a basement. They are also affordable and are resistant to chemicals and are weatherproof. This entry was posted in Pallets, Plastic Pallets on September 16, 2014 by madden_david.